The number of Palestinian refugees resident in Lebanon is officially 174,422 individuals, according to a census held by the Lebanese Palestinian Dialogue Committee (LPDC). The count is the first of its kind and is the result of the Cabinet’s desire to reach accurate figures. It also reveals household conditions surrounding housing, families, and individuals. The study was a result of a combined project between the Central Administration of Statistics (CAS) representing the Cabinet, and the Palestinian Central Bureau of Statistics. The project was financed by UNICEF and the governments of Japan, Switzerland, and Norway. A total of 592,711 individuals are registered in the records of the Ministry of Interior, and 459,292 registered in UNRWA records as of March 2016. The refugees are distributed among 12 camps, in addition to other 156 locations spread outside the camps. Figures show that 45 percent of the refugees live inside camps, and the remaining 55 percent within the other locations. The census covered Palestinians living inside camps and major gatherings. Saida hosts the highest density of refugees, reaching 36 percent, followed by locations in the North which make up a quarter of the refugee population. The remaining individuals are distributed between Tyr, Beirut, Chouf, and Bekaa. The average refugee family included four members. The total recorded number of families was 55,473 distributed among 52,176 residential units. The level of school attendance for the age bracket between three and 13 years reached 93.6 percent, while level of illiteracy is seven percent. Unemployment among the work force is 18 percent, with the highest share for youth aged less than 30 years. 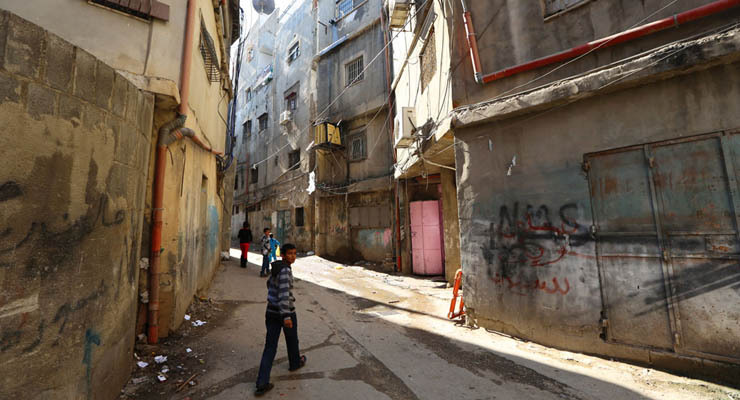 Palestinian refugees constitute 73 percent of camp inhabitants. The remaining residents include Lebanese, Syrians, and other nationalities.